Stefan Babchuk: The Caribbean Cowboy and Mahahual’s Artist! To my knowledge, Mahahual does not have an official “town artist”. Don’t get me wrong, there are no shortage of artist who roll through the area, that is for sure. Just a look at the painting on some of the buildings will show that. But someone who can paint flowers and fish is not what I mean when I say a “town artist”. What I mean is someone who has come to Mahahual and managed to connect us all to its rustic charm, its incredible colors and textures and its old world innocence, through his paintings. Someone like Stefan Babchuk. When you look at his work, you connect with it intimately, like you know that spot, and of course, it is always a special spot. 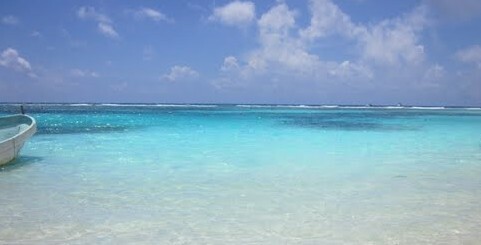 It’s Mahahual! His paintings show an often seen, but seldom captured essence of our town, and that is why, I think, he really has become, “Mahahual’s Artist”. He first came to town a few years ago, his guitar in one hand, and a brush in the other, partly because of his long love relationship with Mexico and partly to escape the cold, wet winters of his home, Vancouver British Columbia. Hanging with his BC buddy Dave Gouci, another part time local guitar slinging/micro-home builder here in Mahahual, he immediately fell into several music clicks around town, where, because of his roadhouse style, he became known locally as the “Caribbean Cowboy”. As time went, his sabbaticals to Mexico began to get longer and more often each year, and so much so, that we now have claimed him as one of our own. Sorry Canada, you’re gonna have to share him. He is not hard to find him when he is in town. He will be sitting someplace along the malecon or the beach, his cowboy hat on the keep the sun from his eyes as he stalks around the easel, adding the brush stokes, and then stepping back to observe them from several perspectives. He has been interesting to watch hanging out at the Tropicante, transferring our ambiance to canvas, as he seems to get lost as he works, almost oblivious to all of us around watching. His style is what I would call classic impressionism, something he attributes to his living and traveling for much of his formative years throughout Europe. His is very much in the mold of a Monet or Gauguin, with the inspirations, brushwork and bold colors, and the immediacy of artists such as of Van Gogh and Renoir. He studied painting, drawing, photography and Art History at the University of Victoria in Victoria, BC Canada and has exhibited his works at the world famous Artist’s Corner, in Vancouver’s Stanley Park. Yes, not only can his paintings be found in little old Mahahual, but in collections all over the world. And if he shares his Mahahual with the rest of the world via his paintings, so much better for us all who actually live here! And painting he is doing these days. We commissioned him to do our place, and since then, many others have done the same. From peoples beach homes, to that special spot that all want to take home with them, people are now commissioning him to create their special connections to Mahahual. We’re hoping the the extra interest in his work will keep him here more year round, but I have my doubts. BC is beautiful too and he has a full time schedule there with his studio work and playing in his troubadour band, “The Beaten Path”. But you never know, now that he is officially “Mahahual’s Painter”, maybe we can get him here a bit more often. You can contact Stefan via email at: stevebabchuk@gmail.com or just stop by and visit with him when you see him painting on the beach sometime. He is a great guy and very interesting to talk to. Some of his work will be on display in the Tropicante, with both signed and limited edition prints, as well as unsigned prints, on sale. Stop in on a cruise ship day and check out his work. You never know, you might just want to take home a memory or two with you when you go back as well. This entry was posted in Mahahual News. Bookmark the permalink. 2 Responses to Stefan Babchuk: The Caribbean Cowboy and Mahahual’s Artist! So talented, I didn’t know he painted too. Are they on display in Tropi? Hi Amber! I should have some originals up by the first of next month, March. The prints might be available a little before but in a few weeks we will have a nice display. Still framing the originals and the print production is still being evaluated as to what types we will have. Looking at different sizes, but also some different papers as well, so all this might take a bit longer than I think, but stop in after the first of March and check. Thanks for reading!